The Midnight Review: John Smithson Fails To Understand Anything! 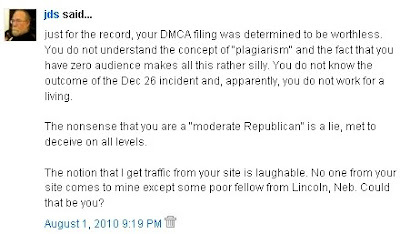 Little known conservative activist and right-wing blogger John Smithson recently visited this site and left a comment stating that the Digital Millennium Copyright Act infringement notification that I had filed was worthless (I had filed one early last month when John Smithson copied the header of this website). Here is the interesting thing - I filed my DMCA notice to prove a point, and that point was to prove to John Smithson that he does not understand the concept of plagiarism. 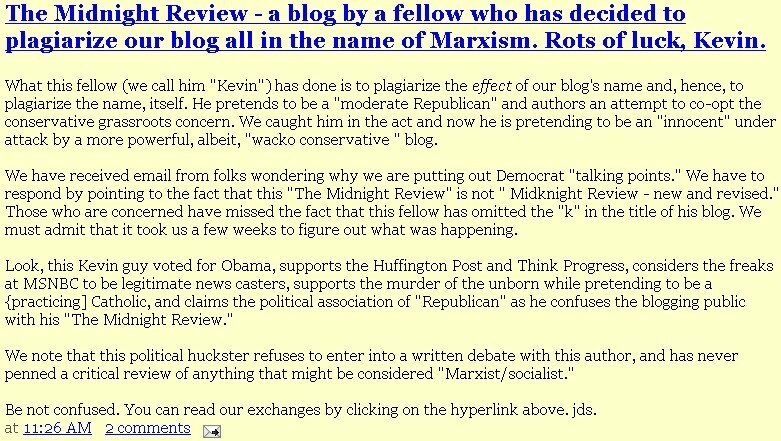 For a couple months, Smithson had accused this site of plagiarizing his because the name of The Midnight Review was similar to his website's name and because both sites post about politics. For a couple months, I had constantly wrote about how Smithson has no comprehension of copyright law, pointing out instances where Smithson himselfs violates copyrights in making his posts or just simple posts to show just how ridiculous his accusations are. The fact that my "DMCA filing was determined to be worthless" can mean only one thing - Smithson's entire argument against this website is worthless. You see, Smithson crawled all the way back to a July 8th article to try and prove me wrong, but he didn't have to go that far back - I wrote a better article on July 24th that showed how Smithson proved himself wrong in a recent blog post he had made. Smithson had linked to the U.S. Copyright Office to explain copyrights, but on that website, the Copyright Office specifically states that names and titles are not copyrighted. Why had John Smithson deleted the above post? Now back to Smithson's comment he posted yesterday - he referenced a couple other things besides the fact that he knows nothing of copyright law. Smithson mentioned a "Dec 26 incident." I believe he is referring to the fact that his original blog was taken down by Google because they claimed it was a spam blog, of course Smithson believes the move was in response to an unfavorable post he made regarding the administration. The only reason why I continually reference this incident is because it demonstrates a trend of Smithson's unethical tendencies. John Smithson copied the majority of the content from a Daniel Klein Article from The Wall Street Journal, a George Will article for RealClearPolitics, a study by The Pew Research Center for the People & the Press, a Joshua Rhett Miller article for Fox News, and a Cat Corben article form The American Thinker. Now add on top of these incidents of plagiarism the fact that Google had taken down Smithson's previous blog for spamming and we can see a pattern. Besides, it has been almost 8 months - if Google was wrong to take down the blog, why is it not back up? Smithson also makes mention of his site's traffic, claiming that nobody visits his site from this one, except for somebody from Nebraska. Here is what Smithson fails to understand - I typically don't hyperlink back to his website when I reference him or something he wrote in an article. 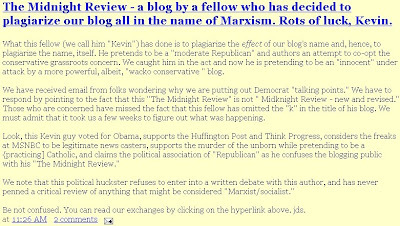 If my readers want to know more about the conservative hack John Smithson and his website, they would have to open another window, go to a search engine, and look for either his name or the name of his site - I wonder how many hits he gets from people searching "Midnight Review," "Midknight Review," or any other thing that relates to the particular post? Essentially, Smithson again proves that he is a right-wing blowhard who knows nothing of anything, either in his right-wing commentary and propaganda or his baseless accusations against the authors of this site. His "cease and desist" that he "issued" to this site is worthless because his entire argument is worthless - The Midnight Review is here to stay and has no plans on backing down because some conservative activist has some child-like grudge (I would expect more from a 65-year-old ex-preacher). Kevin, if he wasn't an idiot, he wouldn't be a Republican pundit. May I respectfully suggest that you are too talented to waste time contending below your own species?